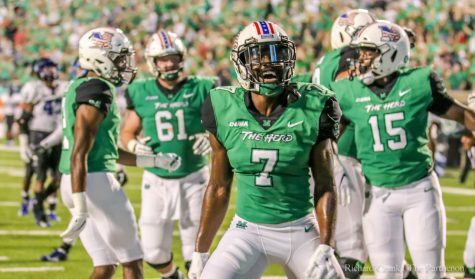 Sporting their black uniforms and new helmets honoring the “Young Thundering Herd,” the Marshall Thundering Herd earned an emotional 42-17 home victory over Middle Tennessee Saturday night. Marshall started the game off fast. 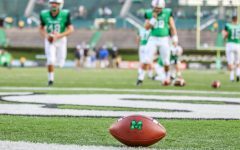 The defense forced a turnover on the fifth play of the game, when Middle Tennessee quarterback John Urzua was picked off by Marshall’s Terry Richardson, who returned the interception 26 yards. This was Urzua’s first official start of his career, but he didn’t rattle easily and avoided any other mistakes in the first half. 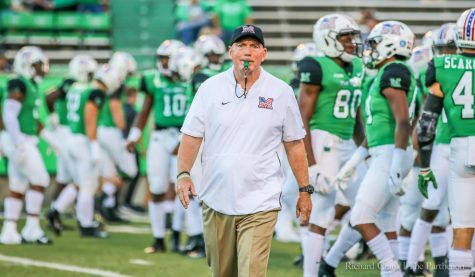 The Herd’s offense took advantage of the good field position and got the ball into the end zone in just four plays, capping off the drive with a three-yard run by running back Hyleck Foster for the touchdown. The teams went back and forth over the course of the first quarter. 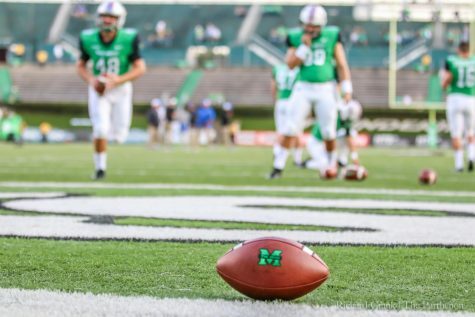 Middle Tennessee answered Marshall’s first touchdown with a 38-yard field goal, then followed that up with an eight play 79-yard drive that gave them a 14-10 lead as the first quarter ended. The second quarter saw more back and forth between the two teams. 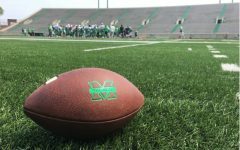 Marshall retook the lead on a 25-yard pass from quarterback Chase Litton to receiver Justin Hunt, who finished the day with two touchdowns. Middle Tennessee quarterback John Urzua did not get overwhelmed in his first half as a starter though. He led another 15 play 75-yard drive that ended with a Middle Tennessee touchdown and gave the Blue Raiders a 17-14 lead going into halftime. The second half of the game was all Marshall. The Herd came out of the half and set the tone with a 74-yard drive that gave receiver Justin Hunt his second touchdown of the day. 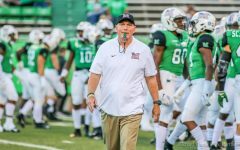 The defense clamped down, forcing multiple turnovers in the second half and allowing the offense to start two drives on the Blue Raiders’ 30-yard line that both ended in touchdowns. 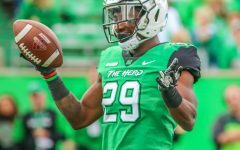 An amazing catch by running back Hyleck Foster on a wheel route gave quarterback Chase Litton his fourth touchdown of the day, and gave the Herd a 42-17 lead that held until the end of the game. 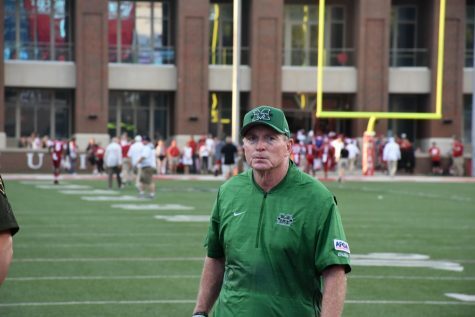 Marshall had a much more balanced game plan this game than in past weeks. 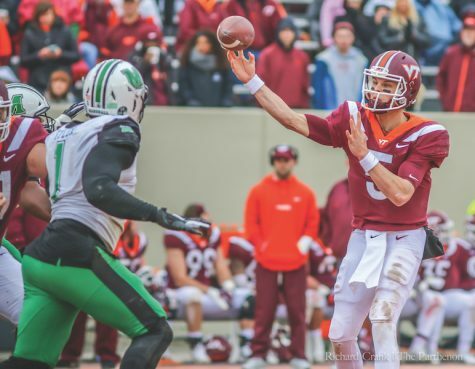 Litton threw the ball just 22 times, benefiting from a solid rushing attack and finishing the game with four touchdowns, 150 yards and no interceptions. 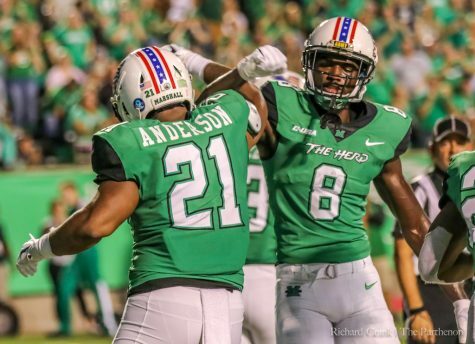 Litton now has a passing touchdown in his last 20 games with the Herd. Litton credited the run game with opening up the passing lanes that allowed his four touchdown performance. 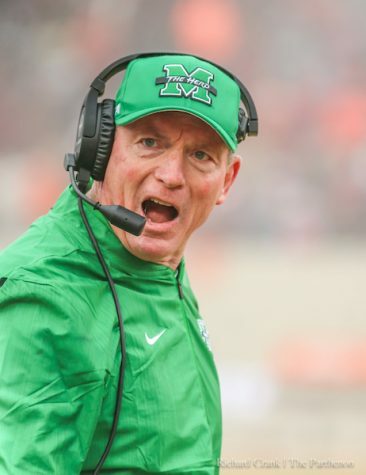 Marshall found success on the ground with multiple running backs early. 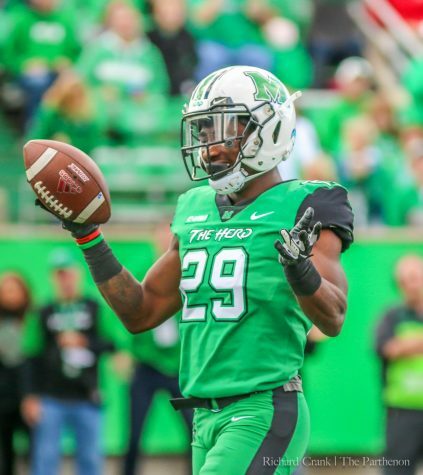 Anthony Anderson was the first Marshall running back to reach 100 yards in a game this season. He ran all over Middle Tennessee, carrying the ball 16 times for 109 yards and a touchdown. Tony Pittman wasn’t far behind him, carrying the ball 15 times for 88 yards. Anderson was quick to credit his blockers for his outstanding rushing performance. 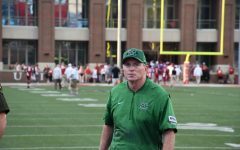 Head coach Doc Holliday said he was impressed with what he saw out of Anderson. Safety Corey Neely led the team with 13 tackles. He also provided a huge boost on defense in the form of an interception and a forced fumble that sealed the victory for the Herd. Neely’s interception was an incredible feat of athleticism. He tipped the ball one handed to himself and came down with it. 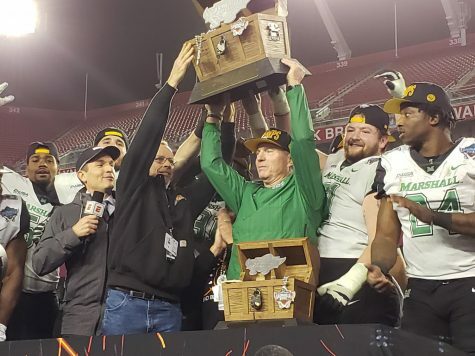 The Herd’s run defense played its best game all season. They held L’tavius Mathers, the number one back in C-USA, to just 45 yards and a touchdown. Mathers had only one big run of 27 yards, but without that he averaged just above one yard a carry. 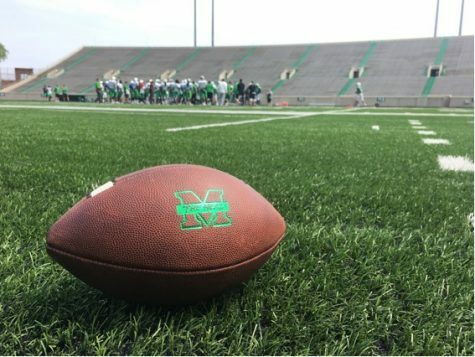 Marshall will look to carry the momentum from their win into next week’s away game against FIU.